VILLAS AND APARTMENTS TO RENT IN IZNAJAR, SPAIN. 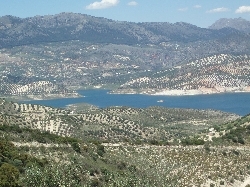 Welcome to our selection of holiday homes to rent in Iznajar, Spain. Izn�jar is a rural village in the province of C�rdoba in Andalucia and is close to the borders of M�laga and Granada. The village itself is a traditional 'pueblo blanco' that contains an 8th century castle and a 16th century church which overlooks the largest lake of Andalucia, the Embalse de Izn�jar which is used as a beach during summers. The lake is safe to swim in with beautiful waters, which you could participate in watersports or fishing. Miles of olive groves surround the village and a few attached sub-villages or "Aldeas" are close by. The most significant festival in Izn�jar is the Semana Santa during Easter week. Locals put on a religious theatrical display in which key scenes from the bible are played out to the rest of the village. And on the 25th April, the whole village leaves completely to celebrate the day of San Marcos and has a picnic in the Valdearenas countryside close by the Embalse. Looking for self catering holiday accommodation in Iznajar? Then below is a selection of holiday apartments in Iznajar and holiday villas in Iznajar that can be rented direct from their owners. You can either click on each listing for further details or you can use our search engine on the left if you are looking for something in particular.